Nosing this golden brown forty percenter was like revisiting a place in the mind. The soft sweet scents transported me back to the first time I tried the Diplomatico Reserva Exclusiva on a dark, bitterly cold and wintry evening. This rum, made by the same outfit as the DRE, was quite similar: caramel, toffee, unsweetened chocolate and salted butter on rye bread. There was a slight salty-sweet note here that hinted at soya, or even tequila, but very much in the background, and as it developed, coffee, dried dark fruits and raisins were also elbowing their way to my attention – not bad at all. I felt warmer just sniffing it, and thought back to the early fun days of Liquorature, where I fought a long hard battle to excommunicate the heresy of the scottish tipple with the rums of the True Faith (ultimately without success, but the fight rages on). 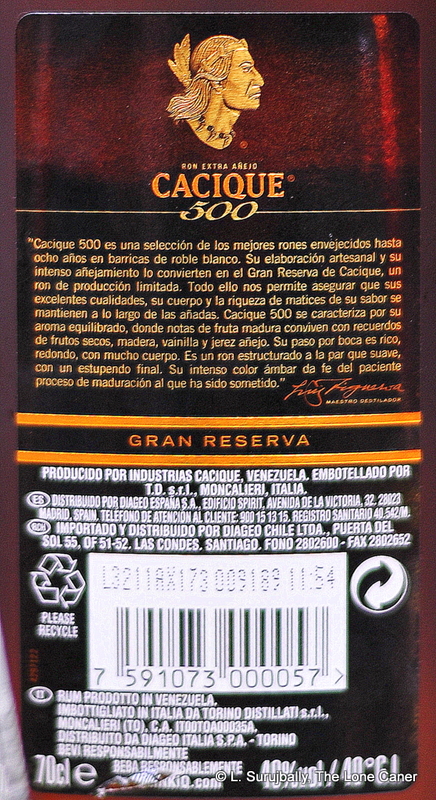 I have to comment on the velvety smoothness of the mouthfeel of the Cacique, which was great – it was like your rice-eating mongrel’s adoring I-love-you-master kiss without the drool, or a hungry cat purring and making nice. It was warm and sweet and unaggressive sort of feel on the palate, smooth and thick, without ever quite stepping off the edge and becoming a sweet vanilla-bomb. Anyway…salt butter again, sour cream, toffee, vanilla, more coffee, very light floral notes, and exactly zero woody or even tobacco notes to be found. Water? Naah, I passed – water might have shredded this thing, it was already too light. You see, the 40% was too weak to really emphasize and bring out the potential of the flavours hidden beneath…I really had to stretch just to sense what I described just now. This made it somewhat unadventurous, uncomplicated, and lacking in what us techno-rum-geeks with our love of exactitude, call “oomph.” And this carried over into the fade, which might have been the weakest part of the entire drinking experience – the brown sugar came out really hard here, with dark, sweet caramel, butter and toffee…barely escaping the dreaded term “cloying” by the slight bitterness of oak and stale coffee grounds. The brand first marketed its rums way back in 1959 – it is now owned by Diageo – and according to wikipedia, it’s the top selling rum in Venezuela (Diplomatico must be pissed). Three varieties exist, the Añejo, the Cacique and the Antiguo, in ascending order, so this is a considered by the makers to be a middle of the road rum. All the rums in the range are supposedly made from molasses distilled in copper pot stills (I kinda doubt that – the profile suggests column still product), aged a little, then blended, then aged again, for up to eight years. The 500 is no newcomer to the stage, being first issued in 1992 to commemorate the date Columbus landed in the New World (I hesitate to use the word “discovered”). Now you know as much as I do, and that’s still more than you’ll find on the Diageo website. Cacique is made by Licoreras Unidas SA in La Miel – these are the same cheerful amigos who make the equally sweet, light and very drinkable Diplomaticos, which may inspire either praise and derision depending on where you stand on the sugar issue. I always kinda liked the Diplomaticos myself, especially in the early years — and even now that I’m more of a dark, heavy, full-proofed aged-rum aficionado, I still think they’re really good as introductory sipping rums (which is also how I came across them). 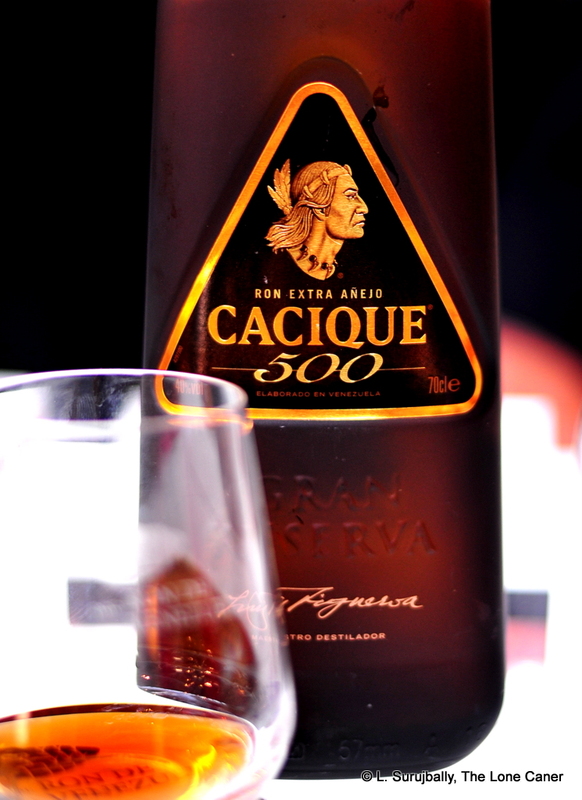 So I expected the Cacique to more or less hew to the same profile, and it didn’t disappoint in any major way. It shared points of similarity with the light Colombian and Peruvian rums, as well as the other Venezuelans, which argues for a commonality of origin in the diaspora of Cuban-influenced roneros. So…did I like it? Yes and no. The smooth and familiar tastes were comforting in their own way, sweet, pleasant, unadventurous, uncomplex – they love you. No attention needed be paid to the Cacique – it wasn’t that kind of rum – but if that’s your thing, add five points to my score. If on the other hand you’re into cask strength beefcakes that menacingly flex their power and dunder and esters in all directions, and show their indifference to your health or your opinion or your tonsils, better take five off. A cacique is an Arawak (Amerindian) tribal chieftain. I wonder if the irony of a bottle label commemorating both the arrival of Europeans, and the title of a chief of those they nearly exterminated, ever occurred to anyone.